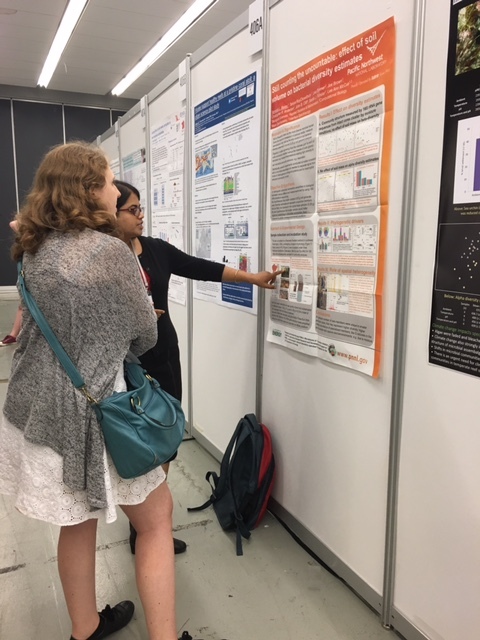 PNNL post-doc Taniya Roychowdhury, who was first author on two of the laboratory’s 10 main posters at ISME16, talks to a viewer at the Montreal conference. At professional conferences, posters are a chance for mostly young researchers to strut their science stuff when they can't chair a roundtable or present a full lecture. So it was on the second-last day of this year's 16th international symposium on microbial ecology hosted by the International Society for Microbial Ecology in Montreal. During the Aug. 22-26 symposium (Monday, Tuesday, and Thursday), 500-plus posters were on display, including 10 offerings by PNNL lead authors and 13 others that listed PNNL contributors. On each of those three days three outstanding posters were chosen as ISME16 winners. PNNL researchers were not among those. But the nine winning authors got free 2017 ISME memberships, opening the way for them to attend the 2017 symposium, slated for August in Leipzig, Germany. During the day, considerable last-minute energy around posters tore up the Twitter airwaves. Dozens of pictures stormed into sight, along with pleas to take a look. "Shameless promotion time," one began. "Tonight! Tonight!" another promised. Then came the classic "Poster up!" which was followed by an invitation to chat about growing fungi in microfluidic systems. One tweeted image said it all about the week's good-natured poster competition. It showed two post-docs having a boffo sword fight. With, of course, rolled-up posters. Many poster topics were certainly compelling. They included investigations of boreal shield lakes, urban soil bacteria, and the skin microbiome of cohabitating couples. "MetFish: A suite of chemoselective tags combined with tandem mass spectrometry for quantitative and comprehensive metabolomics analyses in extreme ecosystems." Chengdong Xu (now at Hexion, Inc.; corresponding author Thomas Metz). "Carbon mineralization through alcohol production in high-carbon freshwater sediments." David Hoyt. "Emergent responses of microbial partnership; acclimation and coordination in a model phototrophic-heterotrophic consortium." Hans Bernstein. "Changes in microbial community and metabolite composition in permafrost thawed under aerobic and anaerobic conditions." Eric Bottos. "Still counting the uncountable: effect of soil volume size on bacterial diversity estimates." Taniya Roychowdhury. "Prediction of interspecies interactions in model complex microbial consortia using a combined analysis of species abundances and genome-scale functional annotation. Is two better than one?" Hyun-Seob Song. "Context-based mutual information networks for understanding coordination of microbial community behavior." Alexander Beliaev. "Nitrogen source governs carbon partitioning among members of a model phototrophic consortium." Steve Lindemann (now at Purdue University; corresponding author Janet Jannson). "Exploiting multi-omics to decipher soil microbiome responses to perturbations." Taniya Roychowdhury. "When deeper and greater depth of sequencing fails for complex soil metagenomic assembly - conquer it with Moleculo." Richard White III.